A statue honouring Karski in Warsaw, Poland. Credit: Wikipedia. The story of Jan Karski’s bravery in the Second World War came to life in a recent documentary in his native Poland. Sławomir Grünberg’s ‘Karski and the Lords of Humanity‘ (Karski i władcy ludzkości), blends archival footage, animation, and interviews to retell a story of wartime heroism. Born in the Polish city of Łódź in 1914, the youngest of eight Catholic children, Jan Romuald Kozielewski later adopted the nom de guerre of Karski. The city exposed a young Karski to multiculturalism. He found himself living alongside Germans, Jews, Russians and Poles. That exposure to Jewish life created an affinity within Karski. Academic pursuits helped him join Poland’s diplomatic service. When interning for the foreign minister, he found himself in Nuremberg, Germany. Karski saw the Nazi propaganda rallies in 1933 and the toxicity of Nazi antisemitism. It created a deeper sympathy for their plight and a sense of foreboding. Other diplomatic assignments brought him to London and Paris. But the outbreak of war brought a career change as he enlisted in the army in 1939. In a few short weeks, invasions from German then Soviet troops divided Poland. The Soviets arrested Karski and placed him in a detention camp; but a lucky escape meant he avoided execution. A fate other Polish officers did not escape. After returning to Warsaw, he joined Poland’s Underground State as a courier. A photographic memory and language skills made Karski a valuable asset. A courier’s job was to cross enemy lines and liaise between Polish forces and Western allies. But in 1940, while on a mission in Slovakia, the Gestapo captured Karski. Under the pain of torture, and fearing he might reveal secrets, he slashed his wrists and ended up in hospital. Karski was later smuggled out of hospital and able to resume his work. Against that backdrop, it had taken the Nazis less than a year to enclose Warsaw’s main Jewish areas in barbed wire. The birth of the Warsaw Ghetto in 1940 gave way to first mass deportations of Jews to death camps in 1942. In that same year, Karski received the most important mission of his life – to travel to England and expose the plight of Jews in Poland. Before departing, he met with various underground factions, including the Jewish Zionist and the Jewish Socialist Bund movements. The underground leaders informed Karski that the Nazis had deported more than half of the 500,000 Jews inside the Warsaw Ghetto to death camps, where roughly 1.8m had already died. Their final message to Karski was simple: “Our entire people will be destroyed“. In August 1942, resistance groups smuggled Karski into the Warsaw Ghetto. From inside he observed emaciated Jews struggling to survive. He also posed as a guard at the Izbica transit camp, where he observed the mass transportation of Jews to death camps. Karski received a hollow key that contained microfilm evidence of genocide in Nazi-occupied Poland. He crossed Europe on local rail networks at a great personal risk before arriving in London. But others did not welcome Karski’s evidence of genocide. Superior Polish diplomats worried that it would undermine their own appeals for international support. Worse still was British indifference. In 1943, he met with Foreign Secretary Anthony Eden. Eden had retorted “that Great Britain had already done enough by accepting 100,000 refugees”. In London, Karski met Szmul Zygielbojm, of the Jewish Socialist Bund, and member of the Polish government in exile, to detail active resistance in the Warsaw Ghetto. Zygielbojm questioned Karski’s intentions because he was not Jewish. Only after explaining his role as courier for the Jews in Warsaw and their plight did Zygielbojm calm down. He interrupted Karski’s testimony by replying “You’re not telling me anything I don’t already know”. After arriving London in 1942, Zygielbojm had microfilm evidence of genocide in Nazi-occupied Poland. The information made its way to the Telegraph newspaper – who revealed the use of gas chambers as tools of genocide since 1941. Yet, in spite of its headline “Germans murder 700,000 Jews in Poland,” the story only made page five of a six-page newspaper. In 1943, the Allies agreed to a secret conference to discuss the plight of European Jewry in Bermuda. It lasted nine days and began on the same day as the Warsaw Ghetto Uprising. The Allies denied the Joint Distribution Committee and the World Jewish Congress entry. A fog of indifference clouded the conference. Neither government referenced the “Final Solution”. The U.S. government sent a low-level delegation and refused to reduce strict quotas to let in more Jewish refugees. From a British perspective, there was a refusal to aid Jewish migration to Palestine. The only success was to create a refugee centre in North Africa; but that took more than a year to establish. Britain and the United States “ruled out the possibility of taking in Jewish refugees from Nazism” fearing that the Nazis would accept. On 11 May 1943, as the Nazis murdered more than 10,000 Jews to crush the second Warsaw Ghetto Uprising. The Nazis then deported the remaining 56,000 Jews to the Treblinka death camp. The added failure of the Bermuda Conference compounded Zygielbojm’s misery. He took his own life in a final protest against Holocaust indifference. After the war, Karski spoke about the impact of Zygielbojm’s death. Karski arrived in the United States in the middle of 1943. He spoke with President Roosevelt (and other officials) of the Nazi’s genocide but their reaction was of disbelief. It took the U.S. government six months to establish the War Refugee Board – to assist those displaced by Axis tyranny. After the war, Karski settled into a professorship at Georgetown University, in Washington DC (until his retirement in the 1980s). He did not speak about his wartime activities until Claude Lanzmann’s 1985 documentary, Shoah. Yad Vashem recognised Jan Karski as Righteous Among the Nations in 1984. In 1992, he suffered the tragedy of his wife taking her own life. He married Pola Nirenska, a dancer and choreographer in 1965, the daughter of an observant Jewish father. The Nazis murdered her family. “This is the proudest and the most meaningful day in my life. Through the honorary citizenship of the State of Israel, I have reached the spiritual source of my Christian faith. In a way, I also became a part of the Jewish community… And now I, Jan Karski, by birth Jan Kozielewski – a Pole, an American, a Catholic – have also become an Israeli”. 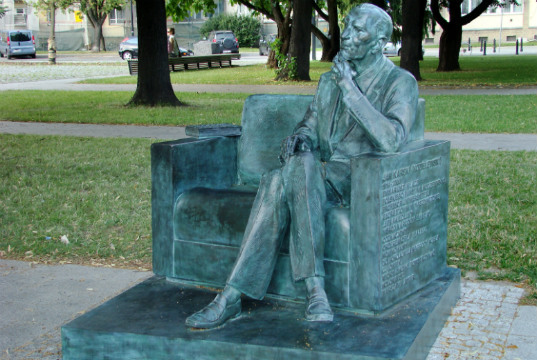 Jan Karski died on 13 July, 2000, at the age of 86.